A couple of weeks ago Isla and I went to a preview screening of a new kids TV programme for Cbeebies called 'Get Well Soon'. It was an early start (particularly as I'd had a bit of a night out with my NCT girls the night before! ), but I love a little trip into town with Isla and it felt really good seeing something before everyone else does. So what's it all about then? Get Well Soon is a fun and informative series, which aims to enlighten CBeebies’ young audience about health and medical issues. Presented by real-life paediatrician Dr Ranj Singh, the series will help children to understand their bodies and to recognise that, while being ill can often be unpleasant, a visit to the doctor can help explain your symptoms and is the first step to getting better. The series tackles this through music, laughter, games and five childlike puppet characters. 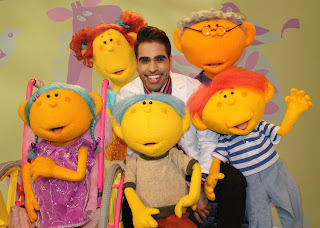 In each episode, Dr Ranj will open up his surgery to a different child puppet: Deep, who is shy and bashful; the inquisitive Riz; Kiwa with her charming confidence; boisterous Jobi; and finally sweet Petal. Each of the puppets will display different symptoms, allowing Dr Ranj, with the help of real-life nurse Morag Calder, to explore and explain 30 of the most common childhood illnesses, injuries and general ailments from asthma to chickenpox, food allergies to hiccups. On the day we got to see the lovely Dr Ranj and he seemed like such a great guy and given that he is a real life Paediatrician I'm sure that after this programme is aired kids aren't going to mind being treated by an all singing/ dancing Doctor! The people behind the idea of this programme spoke before we saw the trailer and one of the episodes and they were so passionate about the programme and it felt like something really new and different for the channel. I enjoyed the episode that we got to watch as it dealt with nose picking!!! Isla has been known to love a good rummage and even Noah is sticking his finger up his hooter already, so I was so pleased so hear Isla tell me that we shouldn't pick our nose because we could make it bleed - Hurrah, the message might have hit home! We had a lovely morning, I desperately tried to get Isla to have her photo taken with Dr Ranj, but she was too shy! I also saw a couple of my childhood heroes - Trevor and Simon! I used to love them on Saturday morning TV (remember catch phrases, Swing Your Pants?/ We don't do duvets? Ummm, no? Ok just me then!) and it turns out that they are part of the writing team on the show which now I know that it makes sense as although this is a show for children, I laughed quite a bit too, it's the kind of humour that appeals to adults too. I would have loved to have got a photo with them, but like my daughter, I was also a bit star struck and couldn't pluck up the courage. Silly eh! All in all we're looking forward to Get Well Soon on Cbeebies, it takes a factual but non scary approach to health matters that all children may encounter in their early years. Look out for it! This sounds interesting. I look forward to seeing it. You should have said hello! Glad you liked it. I wrote the Jobi eps, Trev the Deep ones... not that the Jobi ones are shallow... though I do still pick every now and then. Don't tell the kids. Ranj is great. I'm honoured to be part of such a groundbreaking Cbeebies show. My girls love this programme. Particularly episodes involving poo! In truth, girls are much better about washing hands, eating and drinking 'good' foods etc. I only need to quote Dr Ranj for almost instant cooperation. A triumph. Thanks.